If you had to pick a film that embodied the perfect summer, Anthony Minghella’s brilliantly accomplished but utterly blood-drenched thriller The Talented Mr Ripley (1999) may not seem like the obvious choice. But aside from all the sinister goings on, the Patricia Highsmith-scribed story of a 1950s hotel clerk who finds himself benefitting from a case of mistaken identity and sent off to the sun-drenched climes of southern Italy with a handsome paycheck, comprises some of the most dreamy locations, set designs and costumes ever to grace the big screen – gloriously captured by John Seale, the cinematographer behind The English Patient and The Dead Poets Society. As the story unfolds, we drift from a bustling New York to the idyllic beaches of Mongibello – a fictitious resort, shot on two separate islands off Naples – then on to a majestic Rome, via the sumptuous seaside port of Sanremo, and finally to Venice, complete with the most picturesque palazzos imaginable. How’s that for a summer road trip? Then of course there’s the pitch-perfect – and aesthetically blessed – cast, all flawlessly dressed by costume designers Ann Roth and Gary Jones. Matt Damon’s Tom Ripley is notoriously one of the most likeable, yet chilling, murderers on film, while Jude Law and Gwyneth Paltrow, as carefree socialite couple Dickie Greenleaf and Marge Sherwood, have rarely appeared more radiant. Throw into the mix a sublimely sardonic Philip Seymour Hoffman as Greenleaf’s spoilt chum Freddie Miles, and a demure Cate Blanchett as unwilling heiress Meredith Logue, and you really couldn’t ask for more. Here, for your inspiration, we consider the significant schooling in summer style Minghella’s masterpiece offers. Tom Ripley’s misadventures would never have happened had he not agreed to fill in for a friend, playing the piano at a New York cocktail party, and borrowing said friend’s Princeton jacket for the occasion. Upon spotting the Ivy League college crest, shipping magnate Herbert Greenleaf strikes up a conversation with the young aspirant – who later admits his greatest talents are “telling lies, forging signatures and impersonating almost anybody” – and enlists his help in retrieving his wayward son Dickie (also a Princeton graduate) from a state of permanent vacation in Italy. Thus begins the series of unfortunate events that reveal to Ripley how the other half lives, giving him a taste of a fruit so sweet, that to have it snatched away is more unthinkable than mass homicide. Lesson one: think twice before accepting any items of clothing that could lead you into deep, uncharted waters – especially when, like Ripley himself, you’ve never learnt to swim. We first meet Marge Sherwood sunbathing on the sandy shores of Mongibello, sprawled on a deck chair next to a similarly lithe and luxuriating Greenleaf Jr. She is wearing one of her many covetable high-waisted bikinis – this one a pale blue, dotted with little white sail boats and trimmed in red. Everything about Marge’s seaside style rings with good taste. She is the queen of clean, white shirts worn open over swimsuits or loosely knotted with a chic patterned skirt. Her accessories are similarly impeccable, comprising an oversized woven basket, tortoise-shell sunglasses, a well-mixed martini, and her favourite fragrance from the celebrated Florentine pharmacy, Santa Maria Novella. Add to the equation a boyfriend of unmatched beauty, decked in Riviera-ready shorts and flannel shirts which serve to highlight his caramel tan, and every summer sartorial mission is accomplished. When Tom Ripley first enters his life, the ever-charming Dickie is greatly amused – his new pal can do a terrifyingly good impression of his father, appears to love jazz as much as he himself does, makes him laugh with his wide-eyed amazement at the habits of the upper-classes, and is willing to do just about anything for him. The two spend many a merry hour cavorting on boats, attending a jazz festival in Sanremo and discussing plans for the future – including a trip to Battistoni, Dickie’s favourite tailor in Rome, to have a suit made for Tom. But Dickie is easily bored and soon becomes disenchanted with his latest toy, casting Ripley unceremoniously from his pram. Without giving too much of the plot away, Tom does eventually make it to Battistoni – a real suit makers on the Via Condotti, founded in 1946 – where he picks out not one but two meticulously tailored suits, with the help of Meredith Logue. These, plus new shoes and a Gucci embossed wallet, see the young wannabe transformed into a veritable Gatsby. Compared to the more mesmerising Marge, Meredith Logue – the reluctant socialite who becomes smitten with Ripley while believing him to be Dickie Greenleaf – seemingly offers fewer lessons in dressing. Logue claims to be embarrassed of her inherent wealth, yet frequently styles herself in an “Old Money” manner, twinsets, pearls and all. That said, she also boasts her fair share of enviable attire. She possesses an abundance of collared cashmere sweaters, for example, in pretty pastel hues: the perfect solution to Rome’s cooler autumn climes. 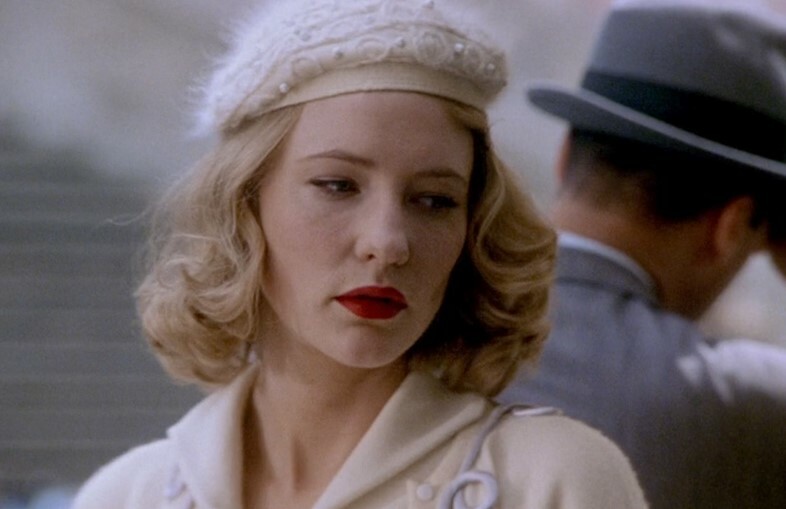 In one scene she teams a cream version of her preferred pullover with a deep red lipstick and matching mohair beret to particularly elegant effect. She also has a pair of excellent wrap-around wedged espadrilles, which she pairs with a loosely flowing skirt and more casual cashmere shawl when she encounters Ripley on the Spanish Steps. Marge as we first encounter her – a breezy young beauty, without a care in the world – is very different to the Marge we are presented with in the second half of the film, as the locations move north and the temperatures grow chilly. The film’s costume designers imbue Sherwood’s wardrobe choices with a latent symbolism: the disappearance of, and her apparent rejection by, Dickie, have dampened her sparkle, and it shows. Her appearance in Rome sees her decked in altogether more grown-up clothing – think a simple beige trench coat, plain round-neck sweaters and refined woollen skirts. That’s not to say, however, that her outfits are any less covetable. Her stunning midnight-blue opera gown, accented with diamonds and sapphires, is breathtakingly lovely, while in Venice she makes the strongest cinematic case for leopard print since Anne Bancroft’s Mrs Robinson, combining a full-length fur overcoat with a chic pillbox hat. Just as Mrs Robinson’s favoured print mirrors her predatory intentions, Marge’s leopardess outerwear coincides with her growing suspicions toward Ripley, and her determination to trap and expose him for who he really is. A killer ensemble for a killer ending.